Gum disease, also known as periodontal disease, is one of the most common health conditions affecting adults today. More than half of the U.S. population contends with a mild to severe form of this disease. While symptoms at first may be relatively harmless, patients can experience serious consequences, including soft tissue deterioration and tooth loss, if they don’t pursue treatment. That’s why Dr. Jorgenson and his team take this threat seriously. Controlling gum disease is not only a matter of maintaining good oral health, but your general health too. Dependable research shows a strong link between periodontal disease and high blood pressure, stroke, heart disease, diabetes, osteoporosis, and low birth weight in newborn babies. Why Choose Advanced Dental Care for Periodontal (Gum) Disease Treatment? A thorough gum inspection is an important component of your regular checkups. 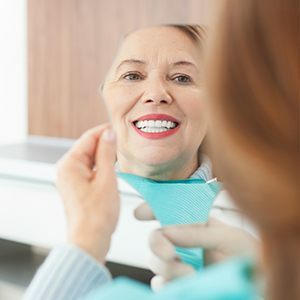 If we find signs of gum disease like gums that bleed during brushing and flossing, red and swollen gum tissue, loose teeth, and deep periodontal pockets, we offer a number of personalized therapy treatments depending on the severity of the case. 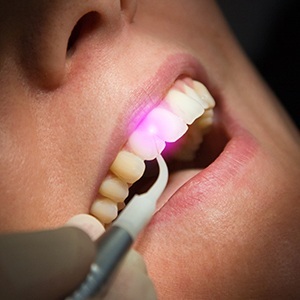 Dental lasers can now be used to target and eliminate infected tissue without affecting the surrounding healthy gums. The laser tip is gently inserted into the space between a tooth and the surrounding gum tissue, and it’s able to kill the specific bacteria that causes gum disease while leaving everything else untouched. Because of this, the procedure is practically pain-free, and most patients don’t require local anesthetic to remain completely comfortable. Along with your effective oral hygiene routine at home, a deep cleaning, also called scaling and root planing, can effectively treat periodontal disease, which is an infection of the gums and surrounding oral tissues. The procedure is a cost-effective and minimally invasive way to arrest the advancement of gum disease. One of our skilled dental hygienists performs scaling and root planing to remove plaque and tartar that build up on teeth above and below the gum line. This buildup traps the bacteria that cause gum disease. Scaling removes the plaque and tartar. 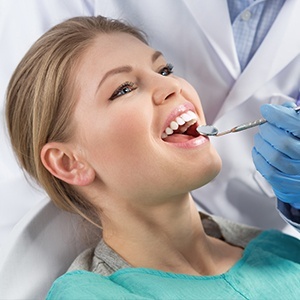 Depending on the severity of the case, the hygienist will either use a tool called a scaler or an ultrasonic cleaner to thoroughly eliminate the buildup. Then, we smooth, or plane, teeth surfaces to prevent plaque from accumulating again and to allow gum tissue to heal. Depending on the extent of your gum disease, scaling and root planing may need to be completed over the course of more than one appointment. Dr. Jorgenson and his team will deep clean your teeth quadrant by quadrant in order to keep you as comfortable as possible during each visit. We usually treat the upper and lower quadrants on one side of your mouth at one appointment and then the quadrants of the other side at the next appointment. Gum recession is an extremely common symptom of advanced gum disease, in which the soft tissues surrounding the teeth literally pulls away, exposing the sensitive enamel located around the roots. With the Chao Pinhole Technique, a hole literally the size of a pin can be used to gently stretch and massage the gum line back into place. Results are instant, and this approach is much, much less invasive compared to a traditional gum graft. The bacteria that causes periodontal disease primarily like to gather in small pockets located between the teeth and gums, and these can be extremely difficult to clean using traditional instruments. In order to eliminate this bacterium, our team can apply a topical antibiotic directly to the gum line that quickly dries on contact. Then, over the course of the next week, it will slowly dissolve and enable the powerful medicine to reach and kill even the most well-hidden bacteria. Crown lengthening works to reshape gums and underlying bone surrounding teeth. 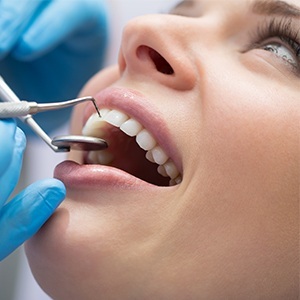 Cosmetically, this treatment is ideal for those who are looking to remove excess gum tissue. However, its restorative benefits also work to remove decay deeply embedded underneath gum tissue. Once completed, you should experience a significantly lower risk of developing future gum disease. 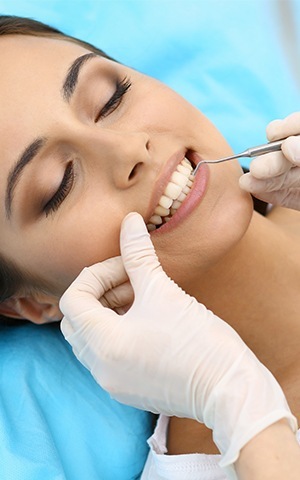 In the past, gingivectomies were largely performed for cosmetic purposes, similarly to crown lengthening. Today, they carry just as many restorative benefits for those with gum disease. 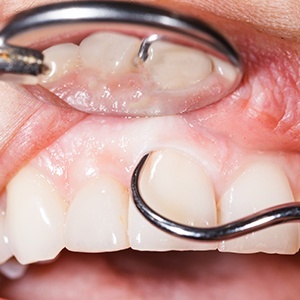 When gums recede, they create deep pockets in between teeth that make it more difficult to remove plaque and calculus. If your gum tissue has pulled away from teeth as a result of infection, a gingivectomy can be done to surgically remove gingiva (gum tissue) and remove harmful plaque. This treatment is usually performed before gum disease begins damaging the bone. Gum grafting is another form of surgery that works to correct the negative effects of gum recession. This treatment is relatively quick and only takes one appointment to complete. 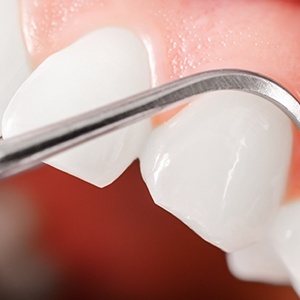 In contrast to a gingivectomy, gum grafts work to restore gum tissue to cover vulnerable areas of teeth by taking tissue from another area of the mouth (typically the roof) and grafting it to the most affected areas. Over time, these exposed sections of teeth will be covered, reducing sensitivity and protecting the roots from future damage. If your gums do not respond effectively to scaling and root planing, osseous surgery may be appropriate for your case. 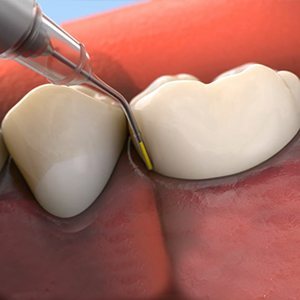 Osseous surgery works to remove gum pockets by trimming infected gum and bone tissue. Treatment also works to promote a healthier environment for long-term maintenance, including improved at-home care and follow-up periodontal therapy. This treatment is recommended if the bone supporting your teeth has been significantly damaged or destroyed. Controlling gum disease is not only a matter of maintaining good oral health, but your general health, too. Dependable research shows a strong link between periodontal disease and high blood pressure, stroke, heart disease, diabetes, osteoporosis and low birth weight in newborn babies. If your gums are sensitive or if you notice any blood when brushing and flossing your teeth, then call our Costa Mesa dental office to schedule an appointment with Dr. Jorgenson. We are happy to serve patients from Irvine, Newport Beach, Huntington Beach, and beyond.